Home> Mobile> Games> iOS iOSAndroid> Casino ActionAdventureArcadeBoardCardCasinoDiceEducationalFamilyKidsMusicPuzzleRacingRole PlayingSimulationSportsStrategyTriviaWord> Video Poker Double Double Bonus FREE! Video Poker Double Double Bonus FREE! 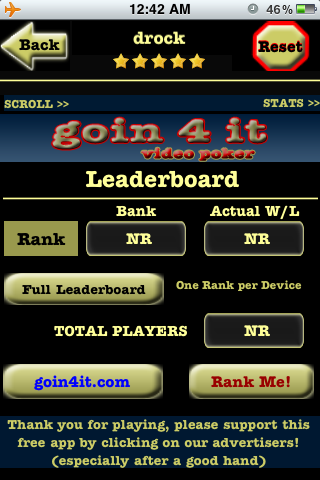 Finally, a FREE video poker app you can keep playing!! Enjoy endless hours of fun racking up millions, playing up to $100,000 per hand! Check your stats often and see how you rank against other players worldwide!! 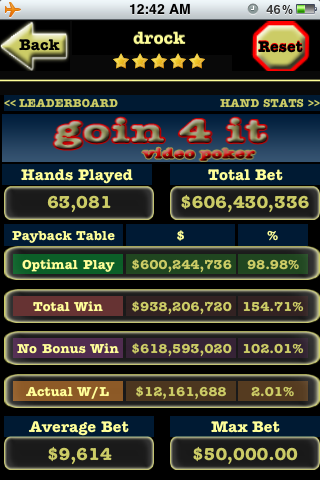 Game odds & paybacks are based on "9/6" Double-Double Bonus Poker with 98.98% payback at "Optimal Play". 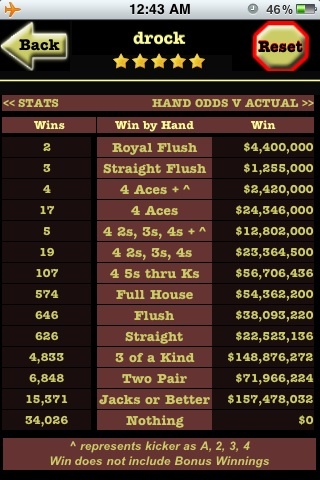 App calculates and tracks your REAL payback % based on your play, and your luck (if there is such a thing). No other free vp app will give you anything close, and no other vp app is as fun to play. The bonus winnings are tracked separately to measure actual player performance. 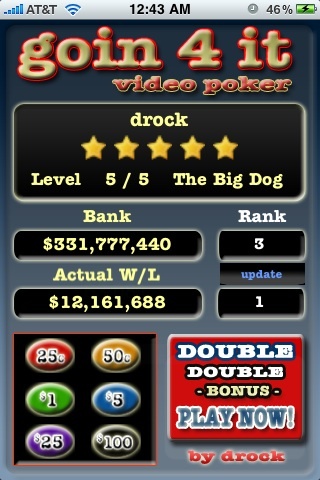 If you actually had $1M to spend on video poker, would you walk away with more or less than $989,800? Play this app and find out!! -BIG Cards, EASY to read and touch!! -Exciting bonus multipliers up to 10x to keep you winning. -Comprehensive stat tracking and performance measurement. -Earn stars by playing hands and reaching higher bank balances to play higher limits and unlock new denominations. -Denominations from 25 cents to 100 dollars per credit. -Touch Bet One (multiple times if desired) or Bet Max to set your bet and press Deal (Bet Max will also auto-deal). -Hold Cards by touching (or unhold by retouching) and press Draw. Leaderboard improvements coming before next release. Thank you for all of your reviews and support. Fixed unexpected program exit on start up (crash) when 20sec timeout reached. 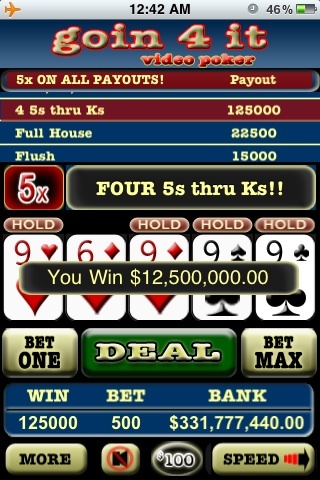 Deuces Wild Bonus Poker - FREE!